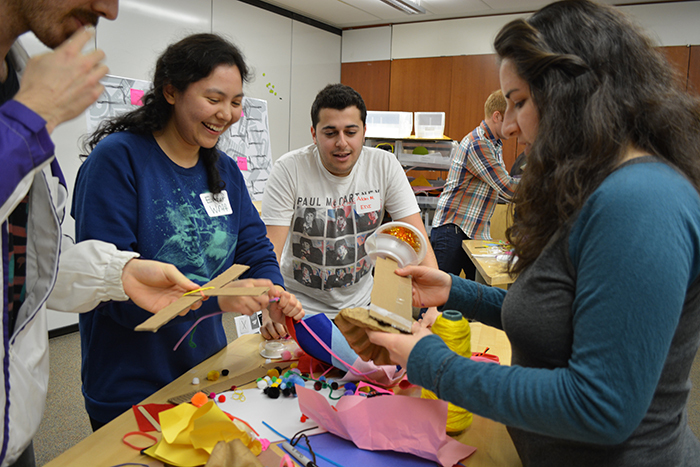 Recently Segal students, faculty and staff came together to celebrate the launch of Mockups, a fast-paced design-thinking card game created by Segal’s very own Dr. Liz Gerber with the help of her Delta Lab students. The launch was part of Segal’s Light Bulbs and Libations, a recurring event aimed at bringing together Segal and Kellogg graduate students. “I love the way the Segal team rallied to sponsor an event that is emblematic of design thinking,” Dr. Gerber said. During the event, students, faculty and staff divided into teams of four to compete in a Mockups bracket tournament. Teams were diverse joining students from a variety of Segal’s programs including Engineering Design and Innovation (EDI), MMM and student group Design for America. “It’s always good to rub elbows with some of the other awesome people in the Segal community,” DFA Fellow Julian Bongiorno said. Mockups is a 72-card playing deck divided into three colors: White cards represent the user you’re building for; black and gray introduce constraints. Each round, one card of each color is drawn. The three cards act as the building prompt for both teams. During the tournament, players used resources from our materials carts to build the prototypes. Sounds doable, right? Well here’s where it gets tough – you only have one minute to work with your team to build a prototype! “People only get to spend about 10 seconds being confused, and then they jump right into making – which doesn’t happen too often,” DFA Fellow Rob Calvey said. EDI student James Wilde agreed that the time constraint kept teams focused. “The game lets us really test the limits of rapid prototyping without overthinking a problem,” Wilde said. Having players understand the power of low-fidelity prototyping along with understanding the role of constraints (i.e. time, topic, materials) were some of Dr. Gerber’s objectives when creating the game. MMM student Jenny Yi said playing Mockups made her more confident in developing a rough prototype. “The game really helped players quickly change their mindsets, which is often needed when trying to rapidly prototype many ideas,” Yi said. Quick seemed to be the theme of the evening, with rounds flying by as winning teams advanced in the bracket. At the end of each round, teams had 10 seconds to pitch their prototype, and audience members chose the team that would be moving forward. After four rapid rounds of prototyping, one final team took the champion title. Winners or not, all players walked away with a fun evening full of opportunities to flex his or her creative muscles. Interested to hear more about Mockups? Check out this brief Q+A with Dr. Liz Gerber about how the game came to fruition.